In order to lawfully operate a motorcycle in the state of Illinois, you must obtain a license or permit. There are two types of motorcycle licenses you may obtain, depending on the displacement of the motorcycle you wish to operate. Most motorcyclists in the state choose to obtain a Class M license rather than a Class L because it allows the operator to ride any type of motorcycle. If you are new to the state or wish to learn how to ride a motorcycle, it is important to follow these steps to obtain your license and avoid any harsh penalties or fines. How do You get a Motorcycle License in Illinois? To qualify for a Class L or Class M motorcycle permit, you must be 18 years old and able to present a current state license or ID, complete the written Rules of the Road exam, pass a vision test, and pay a permit fee; or you must complete a driver education course and be enrolled in a motorcycle training program if you are 16 or 17 years of age. A Class L or M permit is valid for 12 months for those over the age of 18 and 24 months for those who are younger. While operating a motorcycle under a learner’s permit, you are only allowed to do so during the day and under the supervision of another motorcyclist older than 21 who has a valid Class M license and more than one year of experience. Once you have received your permit, there are a few steps to get your license. 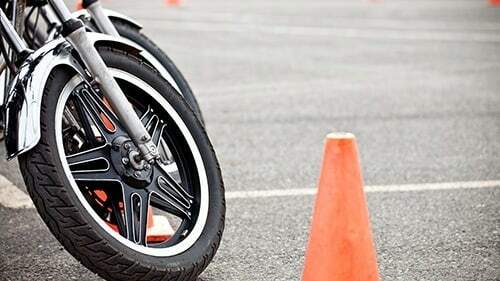 Aside from IDOT-approved safety courses, the Illinois Department of Transportation offers various Motorcycle Rider Education courses to help you learn how to operate your motorcycle in a safer manner. The completion of the Basic Rider Course and Intermediate Rider Course may be used to the same effect as an IDOT-approved safety course, in that completion of both courses allows you to waive the written and on-cycle tests if you are 18 years of age or older. Basic Rider Course: This course offers training in a classroom setting, and students must all be 16 years of age or older and have a valid learner’s permit to be able to enroll. The course includes 8 hours of training in the classroom as well as 12 hours of training on a motorcycle and will cover all of the basic riding skills, rules of the road, mental skills, and street riding skills needed to operate a motorcycle safely. This course doesn’t only allow you to waive the written and on-cycle exams; it may also qualify you for discounts on your insurance. Intermediate Rider Course: Once you have completed the Basic Rider Course and obtained your Class M or Class L license, you may enroll in this course for additional on-road training. The class covers more advanced riding skills than the Basic Rider Course and offers strategies that will help you remain safe and alert on the road. It runs a total of 9.5 hours, and completion of the course allows you to waive your written and on-cycle exam when renewing your license. Basic Rider Course 2: After completing the Basic Rider Course and Intermediate Rider Course, you may take this 8.5-hour course to obtain training that is more focused on your driving skills. You will need to own your motorcycle or have written permission to use another person’s bike to enroll, and you must already have obtained your Class M or Class L license. Advanced Rider Courses: Two advanced rider courses are available specifically for riders who are more experienced and are looking to hone their skills. Each 8.5-hour course focuses on braking techniques, the behavior of other bikers on the road, and more advanced driving techniques. Boots that cover the entire ankle and are not made of cloth or canvas. Leather is the preferred material for motorcycle boots but is not necessary as long as your boots are compliant with safety standards. Long pants made out of denim, leather, or another sturdy and appropriate material. You may not ride your motorcycle wearing shorts or pants made of thin materials. Illinois Motorcycle Safety It is important to be aware of and vigilant regarding safety concerns when riding a motorcycle, even if you have completed all of the available motorcycle riding courses. Motorcyclists have a very limited amount of protection on the road and are often overlooked by other motorists. Driving defensively and paying attention to other drivers at all times will reduce your chances of being involved in an accident. Using common sense and refraining from reckless behavior will protect you and those around you.